The best birthday present an ex can give is to leave you TF alone. At least once a year, something terrible happens. You wake up on what feels at first like it's going to be a normal, maybe even good day, and then you see it—the chilling Facebook notification that it's one of your ex's birthdays. In these times of crisis, you need a game plan for how to move forward. Here is that game plan: Do not dare send them a "happy birthday" text. If you think sending a "happy birthday!" text to someone you once dated/boned/were in love with/whatever seems perfectly inoffensive, you are wildly out of touch. It's the text message equivalent of a bird that flies overhead only to poop on your shoulder (while you're wearing your favorite shirt). It's one of those things that people who like to call themselves "nice" but are actually terrible do as proof of their "kindness." These texts are not at all about wishing happiness upon someone you probably hate a tiny bit, so much as they're about establishing an emotional high-ground. The secret subtext behind every happy birthday text from an ex is: Look at me, I'm so ~Over It~ that I can wish you a "happy" day and it's totally fine! There's no such thing as an altruistic "happy birthday!" text when exes are involved. Mostly because an ex can never just say "happy birthday!" and leave it at that. 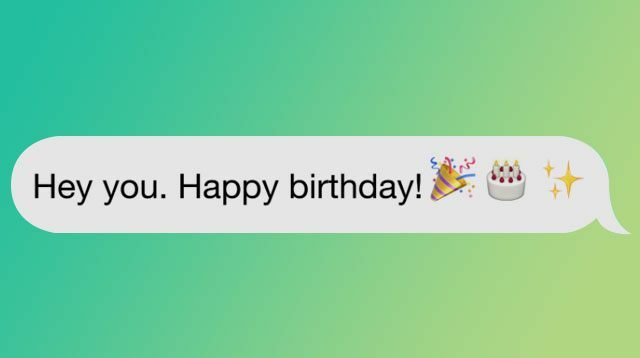 A birthday text from an ex always comes with a side of something horrible, like: "...and I hope you're doing well, [INSERT YOUR NAME HERE]" or, "know it's been a while since we talked but..." At best, you can muster up the grace and courage to politely respond, "Thanks!" and delete the text thread forever. But at the very worst, your birthday—the one day a year it's totally acceptable to celebrate yourself and be selfish!—is ruined by the blast from the past. I can understand the impetus to say happy birthday to an ex, especially a serious one who you experienced at least one birthday with. It's a moral quandary! If you don't say happy birthday, will they think you're being salty and are secretly wishing they have an unhappy birthday? But then again, if you do say happy birthday, they might not respond, or worse, they might respond with a cold, "Thanks." This would all be much easier if there was just an established rule for this situation. And that rule should be: Just don't send the damn text. Bury your phone in the dirt for 24 hours if you must. Because the actual best birthday present you can give to any ex is to leave them the hell alone. No texts, no e-cards, no Edible Arrangements baskets, no nothing. Just let them enjoy their special day the way they want to—completely without you. There are very few exceptions to this rule. If you and your ex are one of those odd former couples who are HONESTLY still friends, sure! Send the text. And by "friends," I mean this ex must be someone you interact with at least three to four times a month with zero drama. Like, if they texted you out of the blue on a Wednesday afternoon, you wouldn't feel the need to screenshot the text and forward it to all of your friends to say "OMG WTF WHY IS HE TEXTING ME??!?" If that isn't the situation between you and your ex, or if you are unsure, don't send it! Don't. You know that platitude that's like, "if you can't say anything nice, don't say anything at all?" If you can't say "happy birthday" to an ex without wishing you could actually say "happy birthday, you wrecked my life and I hope your cake tastes like a pile of sand," then don't say anything at all. If you're very lucky, your garbage ex will return the same favor to you.